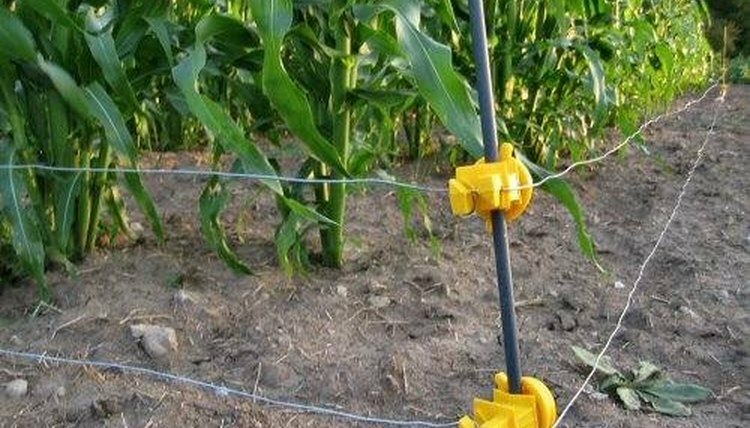 Building an electric fence is an essential skill that will help keep farm animals and livestock contained within a certain temporary perimeter without the cost and labor of installing a permanent fence. Installing an electric fence charger is fairly simple and safe to do yourself. Hang the the fence charger on a corner post of the enclosed area that is either closest to a power outlet or is the easiest to access. There are AC plug-in, battery and solar-power-operated types of fence chargers. Each has its benefits and operates equally well with proper maintenance. Hammer a steel rod into the ground near the fence charger. Cut a 2 foot piece of wire and wrap 1 foot around the steel rod. Attach the other end to the wire to the ground screw on the electric fence charger. Cut a 2 foot piece of wire and attach one end to the electric output screw on the electric fence charger. Attach the other end of the wire to the electric fence wire to be charged by wrapping it around it several times. Hook your electric fence charger up to power. For an AC plug-in fence charger, plug in the fence charger to a standard 110V outlet. For a battery operated fence charger, hook the black clamp from the fence charger onto the negative post of the 12V battery, hook the red clamp from the fence charger onto the positive post of the 12V battery. For a solar power operated fence charger, allow for the charger to sit in the sun for at least a day to have the charge build up. Turn on the fence charger. If the fence is in proper working condition and there are no grounds in the system, then the fence charger meter arrow will be in the yellow to green range meaning the electric fencer is charged.